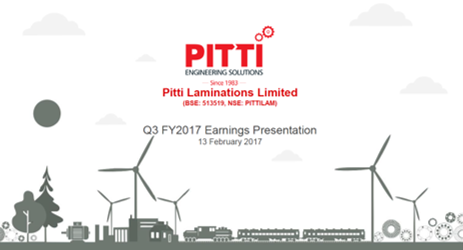 Founded in 1983, Pitti Laminations Limited is India's largest and most reputed manufacturer of Electrical Steel Laminations, Motor Cores, Sub-Assemblies, Die-Cast Rotors and Press Tools. It is the largest exporter of laminations from India. The company has already diversified into manufacturing of Castings, Steel Fabricated Parts and machined components stator and rotor assemblies with plans of diversifying into forgings. Growth is targeted through continuous forward and backward integration plus enhancement of capacities. The company has the distinction of being the first lamination manufacturer in India. The company remains confident of medium term growth prospects on the back of the various initiatives taken by the government. Continued government focus on revival through increased infrastructure allocation is widely expected to drive growth in the sector in the near to medium term. 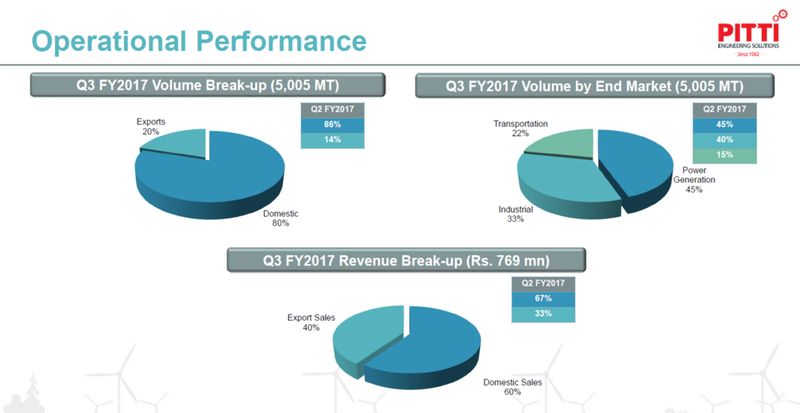 Overall volume registered a growth of 1.7 % YoY to 5005 MT in Q3, FY 2017 as compared to same quarter last year. Sales of stator frames saw good growth with total 91 units sold in Q3, FY 2017. The company registered a revenue growth of 8.6% YoY to INR 76.9 crores in Q3, FY 2017 on account of growth in domestic volumes and better price realization. Domestic sales accounted for 60% of total sales while Exports accounted for 40% of total sales. Domestic sales grew by 4.8% YoY to INR 45.4 crores and Export sales increased by 14.5% YoY to INR 30.7 crores in Q3, FY 2017 as compared to Q3, FY 2016. Other operating income accounted for INR 0.8 crores. EBITDA for the quarter more than quadrupled an increase of 321% YoY to INR 9.7 crores, compared to INR 2.3 crores in Q3, FY2016. EBITDA margin for the quarter was 12.7%, an improvement of 9.35 percentage points from same quarter last year. PAT for the quarter was INR 1.9 crores, compared to a loss of INR 4.0 crores in Q3, FY 2016. PAT margin for the quarter stood at 2.5%. 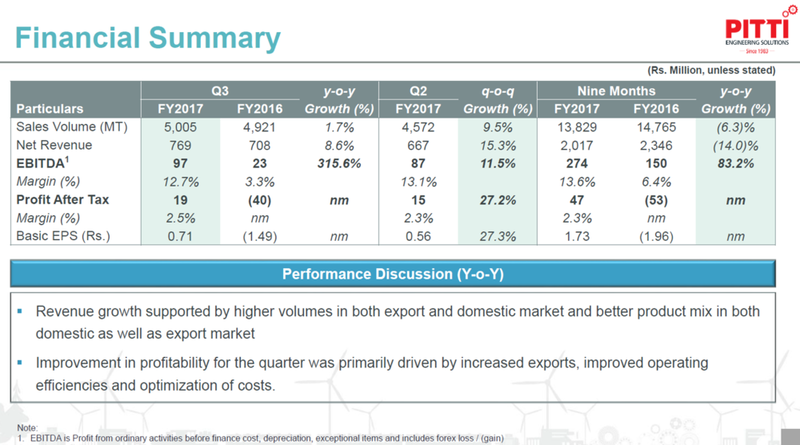 Improvement in profitability for the quarter was primarily driven by increased exports, improved operating efficiencies and optimization of costs. As on 31st Dec, 2016, Total debt of The company stands at INR 154.6 crore with INR 41.8 crore of long term debt and INR 112.8 crore of short term debt. Cash and cash equivalents for the quarter stood at INR 13 crores, resulting in a net debt position of INR 141.6 crores. Net worth of the The company stood at INR111.6 crores at the end of the quarter. The company had a conservative leverage profile with the total debt to equity ratio of 1.4 and Net debt to LTM EBITDA of 4.5. The company expects the lamination exports to be in the range of 3000-3500 MT against the earlier target of 4500 MT for the entire FY 2017. It is because there has been deferment of order from Q3 to Q4. However, Exports as such has increased because there is an increase in stator frame. So, in revenue terms there is no deduction but in quantitative terms there has been shortfall against projection for laminations. The company expects exports to GE to be in the range of 4000-5000 MT in FY 2018 & FY 2019. On Domestic front, The company expects to do ~16000 MT in entire FY 2017 & ~18000 MT in FY 2018 as there is strong domestic demand. Raw material price has started increasing and increased about INR 2.70 per kg in Q3. This price rise will be passed on to the customers as it is mentioned in Price Variation Clause. The company has already raised term loan from SBI and does not see any long term debt requirement in near future. Price realization for scrap is stable since last quarter. It is between INR 18-19 per kg. The company estimates sales for FY 2017 to be in the range of INR 290-310 crores. It means expected sales of ~INR 100 crores in Q4, FY 2017. Despite reduction in Top line estimates for FY 2017, The company would be able to meet its Margin projections because of higher operational efficiency. The company believes that with consistent margin improvement in coming quarters, they would be able to return to 13.5-14% EBITDA margin trajectory. In Q3, FY 2017, Promoter infused around INR 25 crore as an interest free loan to the The company. This is unsecured loans from the promoters particularly for the CAPEX and working capital requirements of the The company. The company has been sanctioned a term loan by SBI for its expansion in Aurangabad & Hyderabad. And there is a stipulation to bring in the promoter’s contribution, so initially to start the work, The company wanted to immediately infuse the funds so they brought it as unsecured loan into the The company from the promoters. The company is going to convert the loan into equity by way of preferential allotment to the promoters. This fresh issue of share as well as convertible warrant so in total amount 251 lakh shares right. The company will go through a postal ballot to get the shareholders’ approval for preferential allotment. It is just an enabling resolution approval from the shareholders. The issue price will be based on SEBI pricing formula and the formula will apply from the date of allotment, when the allotment is considered by the board. That is after the postal ballot and all the statutory approvals. Due to certain reasons, SEBI has restricted the The company from raising funds for the equity and this issue has not yet been resolved. The open offer is pending with the SEBI for their approval of DLOF. The company has filed again fresh with SEBI requesting them to clear the document based on SAT orders. In the interim, the additional equity being brought in by the promoters is not restricted by pending open offer so this is a separate activity. This division between fresh issuance of warrants is just to avoid an open offer. The company's plan for Plant 4 set up at Hyderabad with machining capabilities for Gamesa and Siemens orders is going as per schedule. It should commence production by Q1, FY 2018. The company is in process of shifting Pune operation to Aurangabad where operation should start by H1, FY 2018. The Pune facility is a rented one and was started as an exploratory facility for Maharashtra sales. The company would now be shifting operations to Aurangabad which is a fully owned set up. Also, maintenance capex would not be a high number for FY 2018, similar to the case for FY 2017. In order to fund CAPEX, The company has raised a term loan from SBI and an unsecured loan of INR 25.6 crores from promoters which would be converted into equity preferential allotment. All three segments in which The company operates viz. transportation, generation and industrial are doing well right now. Particularly during the last quarter there was improvement in the transportation. The company has an estimated target of INR 400 crores sales in FY 2018 and EBITDA margin of 13%-15% which depends on product mix as well. For GE India, materials are already under the sampling stage, some of the samples have been already approved and some documentation is going on. The company expects to start the commercial supplies by Q2 FY2018. It will be INR 50 crore worth of order for every year right for the next 10 years. However, there is uncertainty for getting this order in FY 2018 but from FY 2019, it will be INR 50 crore a year order. The EBITDA margin for these orders may be 14%-15% depending upon the product mix. Other than lamination, machining is one of the majorbusiness that The company is growing with GE. So machining of the castings is the reason for this expansion of plant 4 in Hyderabad is planned. The company's casting business received order from Gamesa for machining, whose first phase is ~3.5 ton casting.The company is in discussion for the lamination business with Gamesa so that would come as a new development for lamination in next year. Other than that most of the major client is with The company in lamination so there is not much scope in large lamination. For small laminations, Crompton would be the major clientele that will start for commercial production in next year. The company is also targeting Alstom but Alstom is slow with their bid process and so it would take time for Alstom to come in. The company does not expect Alstom contract to be as lucrative as GE, as Alstom deal is for electric locomotives whereas GE deal was for electric diesel locomotives.